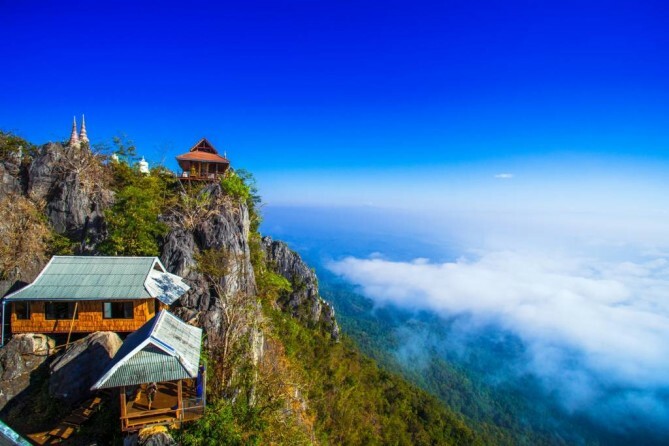 What’s regularly voted some of the must-visit cities in northern Thailand often missed out a lesser-known destination of Lampang. 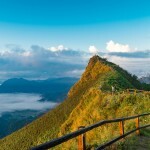 In this Lampang travel guide, those wonderlands hidden in the city are waiting to be discovered. The city’s status reflects what makes fame for itself as the one and only ‘Town of Horse Carriages’ in Thailand, adding uniqueness for its traditional vehicle during the reign of King Rama the Fifth, which has become one of the things to do in Lampang. 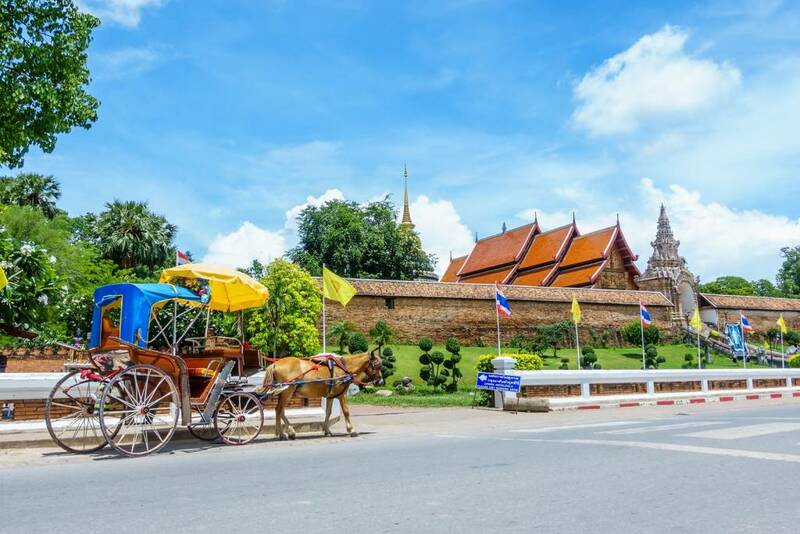 Visitors can hop on a horse-drawn carriage that trots through Lampang downtown. The rhythm of folklore is still lucid as much as the charm of Thainess that intersperse throughout the city. Today, Lampang embodies a compelling mixture between natural wonders and northern Thai architecture as shown in its ostentatious Buddhist temples. 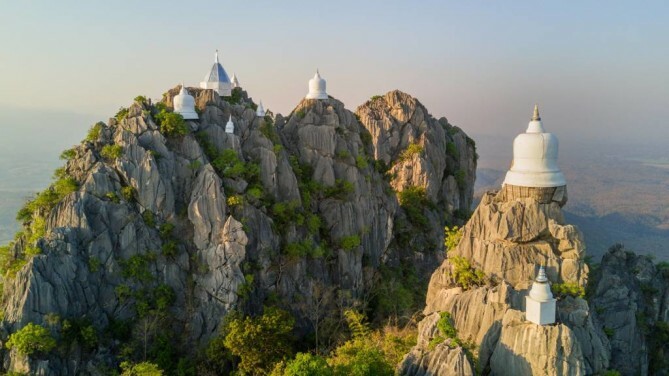 In the thick of many iconic religious sites, Lampang is essentially boasting wonderful natural setting such as amazing waterfalls, natural emerald pool, and hot spring. Dining at some of its riverfront restaurants can be one of typical things to do in Lampang as it seems like a cliche found throughout the town. A pair of naga handrails on staircase that leads to the arch-shaped door on the entrance is classic photo background at Wat Phra That Lampang Luang. 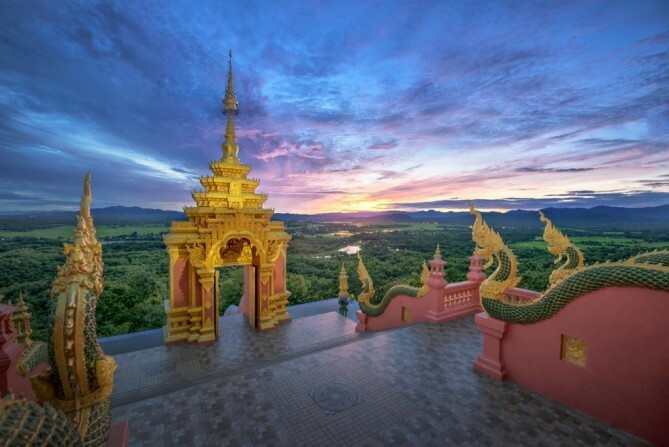 Regardless of how sky color changes each day, it has always been the most remarkable site among all that Buddhist temples in Lampang has to offer. Legend has it that 2,500 years ago, the Buddha once made a visit and gave away a strand of his hair which now been enshrined in the temple’s large chedi. It’s subsequently nicknamed ‘the Temple of Lampang’s Great Buddha Relic’. Supplement that Wat Phra That Lampang Luang is a prototype of Lanna-style architecture, it delicately made out of wood with remarkable open-space viharas with a three-tiered roof. 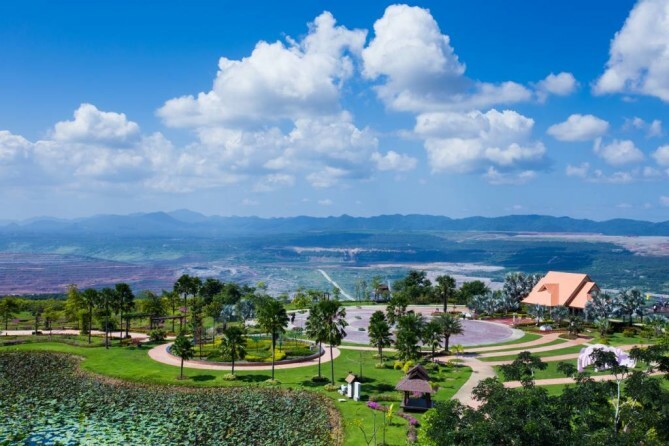 Not too close, not too far with 18 kilometers from the city center, it makes perfect for one of the places to visit in Lampang and for this Lampang Travel Guide. Wonderland does really exist. In all its aspects, Wat Chalermprakiat is claimed to be a wonderland required all pilgrims to take a walk of 1 kilometer from Doi Pha Mok rest area to on top of Pu Yak mountain. Traveling through a forest to the summit magically gets you closer to nature and brings out the explorer in you. 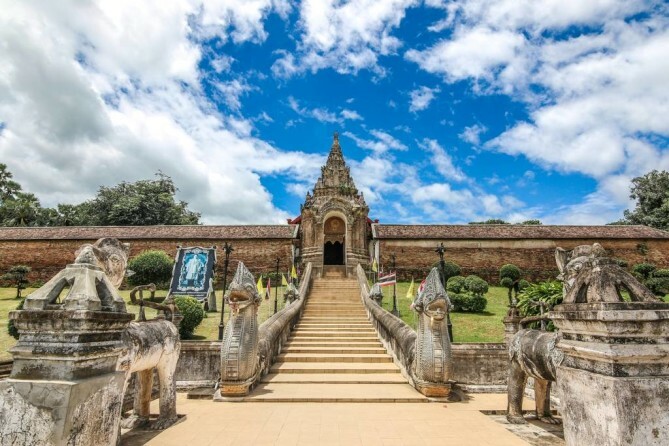 As one of the up-and-coming places to visit in Lampang, Wat Chalermprakiat takes the spotlight in this Lampang Travel Guide thanks to its jealously perfect location. The temple provide a panoramic view of different types of landscape including the Jae Hom district’s terrain along with rice paddies in which a small river cuts through it. More than 10 pagodas sitting on each hilltop are the seed of faith from monks and villagers, which took 10 years to complete. It has been evidently proved about the discovery of the Buddha footprint imprinted on a high peak. To speak of slow life stay in Lampang, outsiders wouldn’t think that one of the things to do in Lampang does include hiking at Wat Chalermprakiat where today it has already become a destination for pilgrims. Are you a fan of elephants? If so, this Lampang Travel Guide will delight you and take you to the World’s only baby elephant training center, Thai Elephant Conservation Center Lampang. 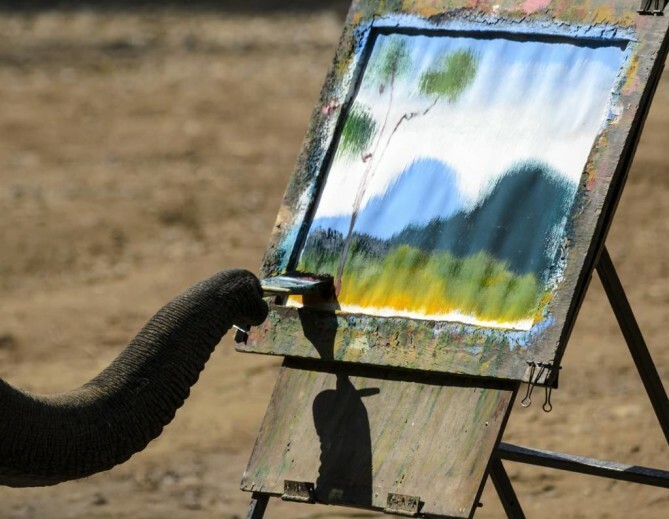 Regarding the shows, all spectators can’t handle the cuteness of baby elephants, some of which are painting pictures, making music, demonstrating agility and much more. Elephant ride in the evergreen jungle is one of recommended things to do in Lampang, it simply soothes you with nature therapy. Elephant is cute. Elephant is a gentle giant. Elephant is too incredibly smart. From various demonstration such as painting, drawing, playing soccer, bathing (itself), cycling and what else? Elephant can even play instruments and naturally amiable. 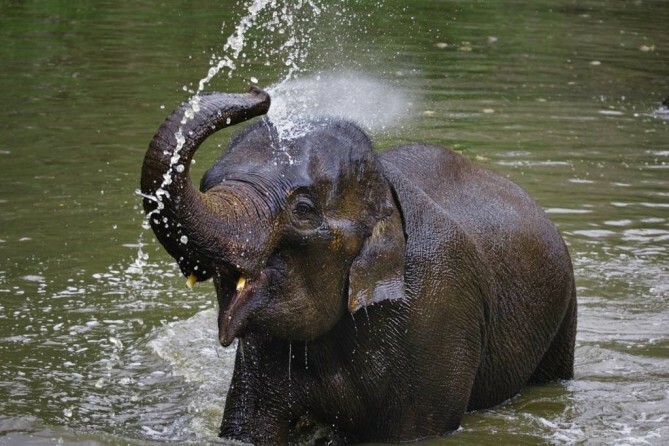 Those who favor to experience Thai’s elephants up-close, a mahout training program is on offer. From single-day to 10-day courses, choose whichever suits you! 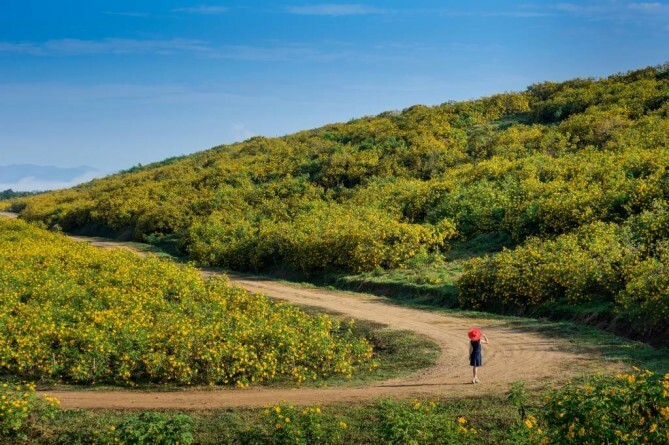 Mexican sunflowers painted 800,000 sqm mountain bright yellow leading to one of the places to visit in Lampang known as Mexican Sunflowers at Mae Moh . 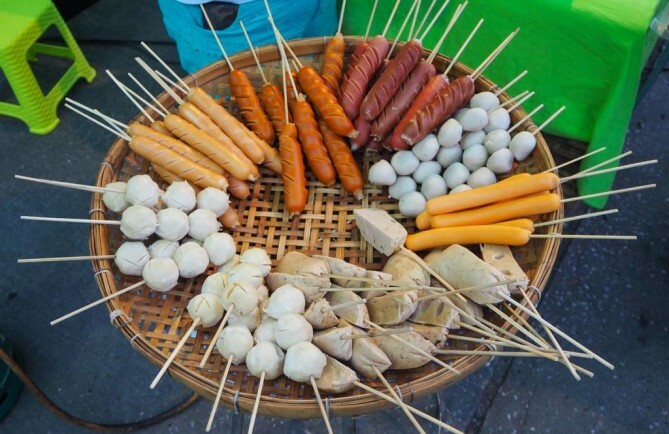 Those longing to be in the thick of it all need to follow today’s Lampang Travel Guide. 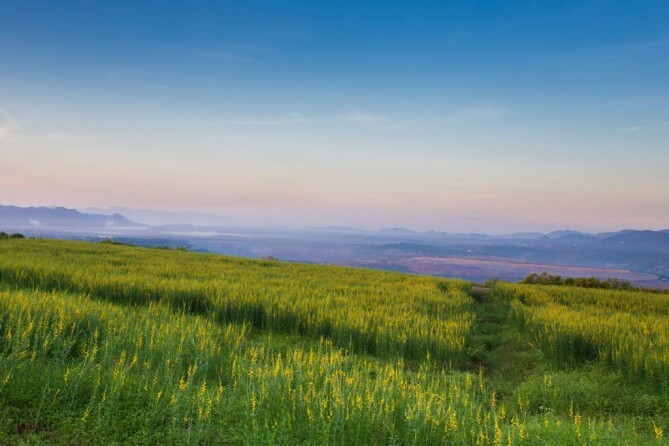 Drive over to the northeast from Lampang downtown for an hour in between November to mid-December, a wonderland of blossoming yellow sunflowers, blue sky, mild breeze and a breath of fresh air draws unassuming, breezy vibes. Thankfully all of these things to do in Lampang are in walking distance to the area hosting Mae Moh festival and Lampang Commemoration Park. It is annually held with a purpose of letting all attendees experience a true chapter of UNSEEN Thailand with the fresh and beautiful nature. Last but not least, Mae Moh National Park, nowhere in Lampang could be more majestic garden than this, not to mention lights decoration that bright up the whole park even in the darkest! 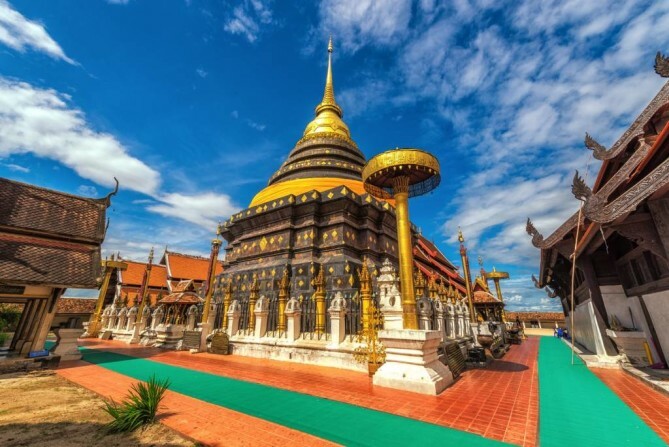 Almost stay in the shadow after its attention-grabbing brother, Wat Phra That Lampang Luang, a 20-kilometer ride southward from its big brother is Wat Phra That Doi Phra Chan. Only few temples do have sea mist as their private spectacle. Today’s Lampang Travel Guide realizes that Wat Phra That Doi Phra Chan now steps out of the shadow as one of the places to visit in Lampang and readily to impress all. 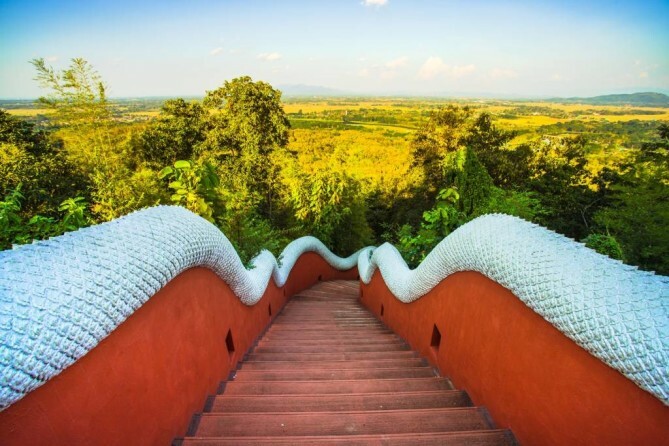 Two white nagas zigzagging on each handrail stretching down to the ground metaphorically look like a path from heaven to earth. Extraordinarily beautiful after the verdant jungle soaking in the rain, a stroll along the staircase with this kind of vista is sure to be noteworthy. For some days, the green scenery can be replaced by ethereal white mist due to climate conditions. Whichever way you see, Wat Phra That Doi Phra Chan is a hidden gem among all rich heritages in Lampang has to offer. It is difficult to fathom how significant Kad Kong Ta or Chinese Market is to Lampang folks. 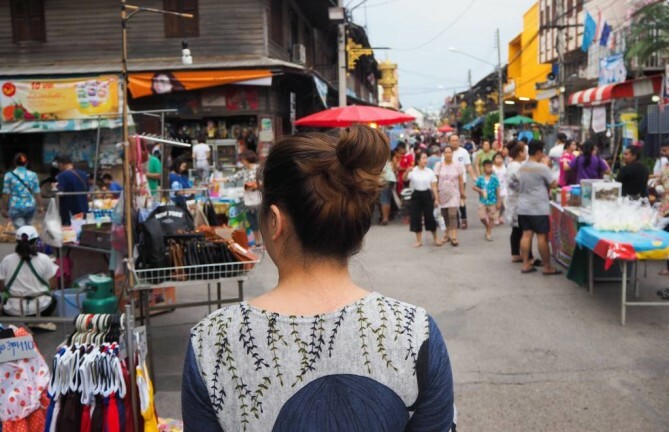 Kad Kong Ta is veritable lifeblood for local retailers, hotel & restaurant owners, and all that business affairs.This old local market used to be highly prosperous during the King Rama IV reign when trading within the country flourished. The arrival of foreign merchants into the country then resulted in the buildings on both sides of the riverbanks to be of various unique European, Chinese and Burmese designs that we are able to appreciate today. Some of which have been gorgeously renovated into gift shops, cafes and guest houses. You’ll see this market becomes exceptionally lively when the time comes as the road is closed and is subsequently transformed into a makeshift walking street selling handmade souvenir, homegrown products and local delicacies. Kad Kong Ta is sure to be one of the places to visit in Lampang listed in any Lampang Travel Guide for shopaholics who relish local shopping experience. Book your flight to Lampang today! 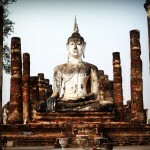 Visit http://www.bangkokair.com/eng/flightdeals/view/lampang to check flight availability. 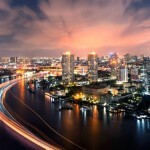 Bangkok Travel Guide | Thailand's Bustling Capital City! Chiang Rai Travel Guide | Northern Thailand's Secluded Haven!